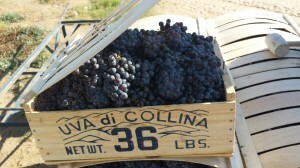 During the fall, a wooden crate from California is cracked open and bunches of purple grapes are flung into a large industrial wine-pressing machine. As more crates are heaved down a long chute, the grinding hum of the press continues until all of the grapes are de-stemmed and pummeled into a stream of flowing juice. For more information on these choose your preferred topic from the drop down menu at the top or on the right side of this page.